My father calls just as we are about to leave the car. It’s his third call of the day. “Don’t pick up,” my husband instructs, fixing me with a hard stare. But I do, immediately rummaging through my bag for a chocolate kiss and popping one in my mouth. Sugar calms. Don’t let anyone tell you otherwise. “Let’s go,” My husband interrupts, exiting the car and opening the back door to release the children. I shoot him my nasty eye glare, which he returns to me with his own give-me-a-break eye roll. Touche. I hang up mildly abruptly, the only way with him, and hurry to catch up with my husband and our three boys who are already headed into the hospital to visit my husband’s aunt. She has some health problems, but the biggest is her progressing dementia. Still, she nods pleasantly when we arrive; possibly happy to see us, possibly uncertain who we are. We try to prompt some conversation but quickly realize that a polite, vacant, ‘No thank you’, ‘yes’, or ‘I don’t know’ is as much as she’s capable of giving. It’s uncomfortable and ultimately we give up on talk, instead opting to hyper focus on our blissfully ignorant boys as they spin quarters across the table. They are too wild, but she doesn’t really seem to notice; her line of vision both straight ahead and internal. 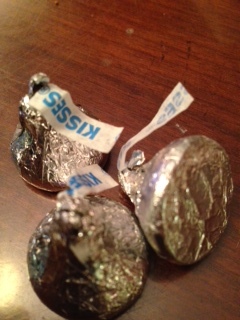 Remembering her fondness for sweets, I find some more chocolate kisses and set them in front of her. Slowly she reaches for one, automatically unwrapping it, and placing it in her mouth. I feel a childish pride in her acceptance and wish I had something more to offer. My husband and I look at each other startled. Was she asking us to leave? Were my boys too loud? I immediately stop the game of quarters. Shortly after, we say our good-byes and leave her sitting in the same seat we found her, still staring straight ahead; her aged fingers slowly working the silver foil of another chocolate. Back in the car, I notice a missed call from my father. Taking a deep breath, I dial his number and unconsciously search my bag for another kiss, which soothes me the moment it touches my lips. It makes me think of my husband’s aunt, sitting straight and placid; seemingly unaffected by our visit, her mouth full of chocolate but no words, and wonder if she was doing the same with us. Posted in Crap that makes me eat too much ice cream and tagged aging, chocolate, coping, dementia, growing older, Hershey kisses, nursing homes. Bookmark the permalink. I was driving home from the gym, my thoughts on other things. Mostly, I was worrying over my last conversation with my father. He had forgotten to secure a ride for his upcoming doctor appointment. He had also forgotten to mail me a letter I had asked for half a dozen times, and he had lost his debit card. Again. None of this was too out of the ordinary. Worrisome, yes, but it had been going on a long time. Compared with other moments like, forgetting whether he took his medications, that he was smoking before he fell asleep, or to turn off the stove, I couldn’t complain. Still, it left me, as always, unsettled; wondering if he really shouldn’t be in some type of care facility. I knew he wasn’t capable of living alone, even with the home health aide coming in daily. He knew it as well, but that didn’t stop him from fighting on threat of his life to remain independent. It was a lose, lose battle for both us, and one so exhausting and old that my brain moved on, remembering that I needed to pick up the dry cleaning and calculating whether I had enough time for the supermarket before school let out. Suddenly, I looked around and realized I didn’t recognize where I was. I had driven this seven minute route to and from the gym, hundreds of times. How could I possibly not know where I was? I certainly wasn’t far, ten blocks at most. Yet, it all looked unfamiliar. Did I not take the right turn? There were only three or four turns to take. Where was I? I panicked, gazing around at the lovely overhanging trees, trying to place my surroundings, and drawing a complete blank. On instinct, I made a U-turn and headed back in the direction I came. Before I even reached the first intersecting block, I knew exactly where I was. 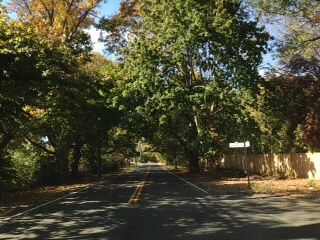 On the right road. Of course. I turned the car back around again, and almost laughed out loud at my senior moment. I was so distracted, I had lost my bearings on a block I had traveled hundreds of times. I made the next left and headed the next few blocks till I made another right, traveled five more blocks and pulled in my driveway. Home. I put the car in park and felt ridiculously relieved and slightly shaken. It was frightening not being able to trust your instincts. It immediately brought me back to my father. Every day, he loses his train of thought, his focus, his time. Every day we argue about things beyond our control. Because it’s one thing to lose your way, but another to lose yourself. Posted in Dad and tagged aging, aging parents, dementia, getting lost, growing older, memory loss, senior moments. Bookmark the permalink.